It is a commonplace to say that black metal these days is rife with cliches and mediocrity, unselfconsciously noshing on tired styles and ideas without the pretense to excellence that makes the posturing and ill-conceived politics at least minimally tolerable. In fairness, this is where guitar music is generally, at least in stylistic terms. But it is also the case that black metal, with its fetishistic atavism and its relatively miniscule pool of cultural references, is prone to this tendency in a particularly extreme degree. It is probably too much to ask for something new under the sun (or in this case the funeral moon) to emerge in black metal. What one can at least hope for is that bands will take what the genre does well and present it effectively. One is happy to report, then, that on their recently released disc Nemesis, Finnish black metallers Azaghal have accomplished just this. One thing was certain: 2009’s Teraphim was going to be a tough act to follow. The latter disc was a bit of a mold breaker for Azaghal, who previously had exhibited that penchant for raw, rudimentary black metal that is something of a trademark in Finland. On early releases, such as Of Beasts and Vultures (2002) and Perkeleen Luoma (2004), Azaghal exhibited stylistic tendencies that called to mind bands such as Horna and Sargeist, maybe not as nasty as Beherit, and without the edge of weirdness of an act like Impaled Nazarene. Recent releases have seen them move to a somewhat cleaner sound, while still retaining a melodic edge that makes their music a lot more accessible to the average listener. Omega (2008) was a breakthrough in this regard, exhibiting a much cleaner and sharper sound than Luciferin Valo, released two years earlier. Often times, the kind of improved gear and musicianship that come from staying together for a decade or more will blunt the force of even the most dedicated thrashers. There is definitely a body of thinking that sees Azaghal of having falling victim to this. Teraphim included a lot more variety in terms of song structure and the means employed to create atmosphere, and I think that, to some black metal purists, this reads as a capitulation to the stylistic expectation of the broader listening public. Although the cuts on Nemesis comprise an even greater degree of stylistic variation, please allow me to assure the reader that this is an absolute fierce (if not entirely orthodox) black metal record. Nemesis contains a lot more elements of pure rock than previous releases, and there are moments when it seems as if they are channeling, not to say copying, other bands. Thus, there are moments at which the incautious listener will think that they have accidentally put on a mid-period Borknagar disc, while at other times the subtleties on offer recall Brave Murder Day era Katatonia. This will undoubtedly viewed as anathema by the purists, but the result is a record that is varied and keeps listener interest long after the endless blast beats of other black metal records would have caused one to lose the plot. All of this is not to say that Nemesis is either meek or diffuse. Azaghal, to a greater degree than a lot of other bands plodding along in this genre, have a very developed idea of how they want to sound, and they are certainly not afraid to mix in liberal doses of traditional black metal fury. 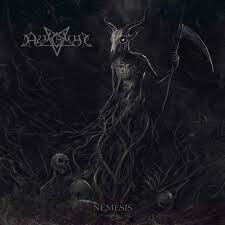 But it is the complexities and atmosphere, born of a willingness to experiment with the orthodox style, which lifts Nemesis above the general level of black metal currently available.